Link. Published on January 27, 2013 by Victor Chan. Link. Published on January 26, 2013 by Victor Chan. Link. Published on January 24, 2013 by Victor Chan. Link. Published on January 23, 2013 by Victor Chan. His Holiness the 14th Dalai Lama, world-renowned spiritual leader of Tibetan Buddhism, honours the DSC Jaipur Literature Festival with his presence. Winner of the 1989 Nobel Peace Prize, he will engage in an insightful and intimate conversation with writer Pico Iyer. Victor Chan, co-author of The Wisdom of Compassion with the Dalai Lama, shares behind the scenes stories of compassion and provides insights on meditative practice and the importance of humour, optimism and forgiveness. Kunzang Choden, internationally renowned Bhutanese writer, reads from her books and brings alive the sights and sounds of her mountainous homeland. Karma Ura, Siddiq Wahid, Victor Chan and Ranjini Obeyesekere in conversation with Nayanjot Lahiri will bring their varied experiences and encounters with Buddhism to this insightful exploration of the many paths of the Buddha’s dharma. The female sangha is an ancient tradition in Buddhism. Yet, women’s spirituality within Buddhist theology is marked by deeply ambivalent and sometimes misogynisticattitudes that are being questioned and challenged by new interpretations and understanding. Ranjini Obeyesekere, Kunzang Choden, Ani Choying and Swati Chopra discuss the issues that face women on the spiritual path. Author and critic Chandrahas Choudhury leads us through an impressionistic medley of writings interpreting the Buddha in literature, with readings by Nadeem Aslam and Ranjini Obeyesekere. Photographer, filmmaker and cultural historian Benoy Behl explores the ethical and aesthetic underpinnings of Buddhist art and spiritual practice. In an illustrated talk that spans millennia, he examines Buddhist creative legacy as a celebration of flux and an interrogation of the ephemeral. Introduced by Sujata Chatterji. Acclaimed Hindi poet Gagan Gill speaks of her experiences of carrying 'a buddhist heart in the world' and reads from poems invoking mystical and mundane encounters including some from her collection of poetry, 'Andhere Mein Buddha' (Buddha in the Darkness). Ranjini Obeyesekere reads and discusses her books and the Buddhist themes that illuminate them. The session will be introduced by R. Sivapriya. Link. Published on January 20, 2013 by Victor Chan. Link. Published on January 13, 2013 by Victor Chan. Link. Published on January 10, 2013 by Victor Chan. Link. Published on January 08, 2013 by Victor Chan. The Dalai Lama, wearing an orange visor, was on stage sitting next to Archbishop Desmond Tutu, who had just flown in from South Africa. The Dalai Lama sat in his usual lotus position on a leather armchair that was a size too small for his folded legs. His knees stuck out a smidgen beyond the armrests. Tutu was hunched forward in his chair; he was carefully examining his hands, which were resting on his lap. He was dressed in a dark suit and a striking purple shirt with a decidedly magenta hue. A large metal cross hung below the clerical collar. The Dalai Lama said, “I myself, I’m believer, I’m Buddhist monk. So for my own improvement, I utilize as much as I can Buddhist approach. But I never touch this when I talk with others. Buddhism is my business. Not business of other people. Frankly speaking”—he stole a glance at the archbishop and declared firmly—“when you and our brothers and sisters talk about God, creator, I’m nonbeliever.” He laughed, perhaps a little self-consciously. It seemed to me that the Dalai Lama’s feelings about God have changed over the years. In an early interview, when I asked him if he thought there was a God, he answered simply, “I don’t know.” He took the view of an agnostic: he understood that it’s not possible to know one way or another whether God exists. “In Buddhism no creator,” the Dalai Lama said at the Chan Centre. “But we also accept Buddha, bodhisattvas, these higher beings. However, if we only rely on these higher beings, we would just sit there, lazy.” He leaned into his chair, threw his head back, and rolled his eyes heavenward. “Won’t help, won’t help. So that’s my view,” the Dalai Lama concluded. Tutu crossed his arms in front of his chest. He looked pensive, deep in thought. Then a smile creased his face. He said, “I was thinking when you were talking about God or no God, who you blame?” Tutu lifted both his legs from the floor and rocked back and forth in his chair. He was gripped in a fit of uncontrollable mirth. Perhaps it was an inside joke. If so, I didn’t get it. Perhaps he meant that if there is no God, then there is no one to blame but ourselves? Tutu stared at the Dalai Lama as his trademark giggle filled the hall. The Dalai Lama then bowed deeply in homage, his head nearly level with his folded knees. He whipped off his visor and saluted his South African friend with an exaggerated flourish. Both men seemed to derive an enormous kick out of Tutu’s cryptic question. Tutu said nothing more for the longest time. He was gathering his thoughts, preparing to expound further on the subject. Although diminutive, all of five feet and four inches, his is an imposing figure. His facial features are broad and remarkably plastic. The audience at the sold-out Chan Centre was delighted with the bantering. It was heartening to see that these two global icons did not take themselves too seriously. That they could, without being the least bit self-conscious, display such childlike playfulness. The Dalai Lama was carried along by the archbishop’s animal vitality, his irreverence, his lighthearted theatrics. He was so in synch with the African that he did something I have seldom seen him do before. He interrupted Tutu, with no regard for niceties or etiquette, in mid-thought. But now that Tutu had given him permission to interrupt, the Dalai Lama turned serious. He said to the archbishop, “The problem is, if we involve religious faith, then there are many varieties and fundamental differences of views. So very complicated. Now that the Dalai Lama had his say, he put his orange visor back on his bald pate. Tutu replied, “Let me just say that one of the things we need to establish is that”—long pause—“God is not a Christian.” He paused again and turned to look at the Dalai Lama with a mischievous glint in his eyes. It had the intended effEct. The Tibetan leader laughed with abandon. Apparently, Tutu was not done with horsing around. “Are you feeling better?” Tutu asked the Dalai Lama, who inclined his body far away from his friend and covered his eyes in mock surrender. “I’ve frequently said I’m glad I’m not God,” Tutu continued. “But I’m also glad God is God. He can watch us speak, spread hatred, in his name. Apartheid was for a long time justified by the church. We do the same when we say all those awful things we say about gays and lesbians. We speak on behalf of a God of love. “The God that I worship is an omnipotent God,” Tutu intoned, opening his arms wide. He paused to let this sink in. Then he said, sotto voce, “He is also incredibly, totally impotent. The God that I worship is almighty, and also incredibly weak. “He can sit there and watch me make a wrong choice. Now, if I was God,” he said as the hall burst into laughter, “and I saw, for instance, this one is going to make a choice that is going to destroy his family, I’d probably snuff him out. “But the glory of God is actually mind-blowing. He can sit and not intervene because he has such an incredible, incredible reverence for my autonomy. He is prepared to let me go to hell. Freely. Rather than compel me to go to heaven. There was total silence in the hall. Tutu’s speech was a tour de force. The audience was captivated by his malleable facial features, which could change from fiery anger to deeply felt compassion in a heartbeat. His voice scaled multiple octaves. His arms and hands were in perpetual motion. He was a showman and preacher par excellence. Later that day, Tutu and the Dalai Lama came together again in a small function room at the Chan Centre. 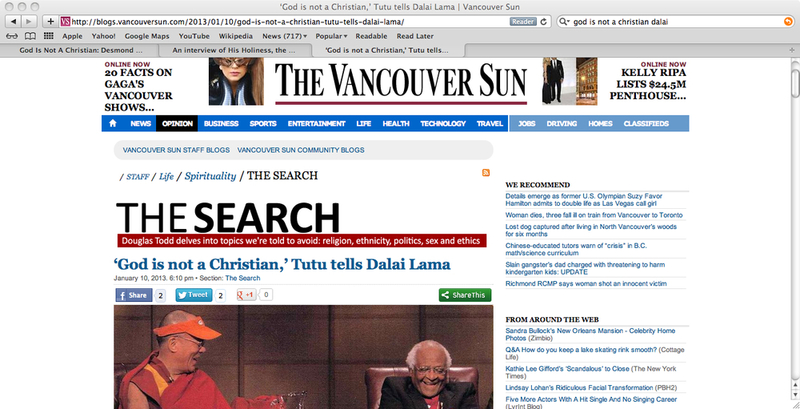 They had another opportunity to expand on their views on religion before Tutu had to leave Vancouver. 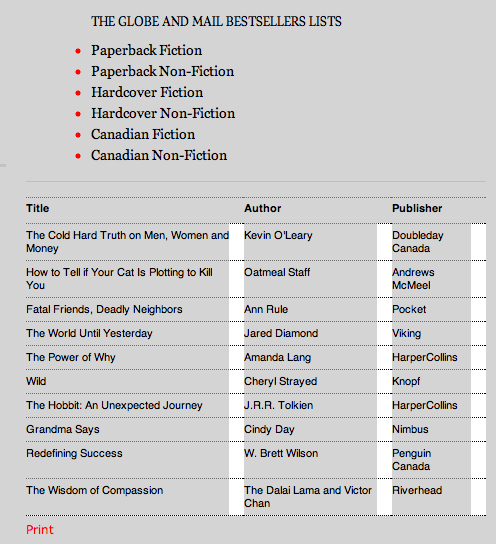 The Dalai Lama leaned back in playful recoil and laughed with abandon. “But we’ve got to be very careful that we don’t say . . .” Tutu continued, ignoring him. But the Dalai Lama had trouble concentrating. His chest was heaving, his shoulders were jiggling with involuntary convulsions; he was having a hard time controlling his laugher. “Because there are bad Muslims, therefore Islam is a bad religion. Because there are bad Buddhists, Buddhism is bad. Just look at the Buddhist dictators in Burma,” Tutu said. The Dalai Lama was not laughing any longer. He nodded vigorously as Tutu finished. Read full post. Published on January 07, 2013 by Victor Chan. Link. Published on January 02, 2013 by Victor Chan. Link. Published on December 25, 2012 by Victor Chan. Link. Published on December 23, 2012 by Victor Chan. The focus of this conference is How Mindfulness Helps Children Thrive. Mindfulness is often associated with helping children manage worries and stress. But there is a small-but- growing body of scientific research, and evidence from practice that indicates that Mindfulness can foster development of a wider range of social and emotional abilities/competencies as well as improved relationships with others (self awareness in everyday interactions, self regulation in everyday activities, compassion for self, compassion for others). What do we mean by "Mindfulness"? We are encouraged by researchers in this field (especially Mark Greenberg http://www.youtube.com/watch?v=R3KXkO7NeG0) to use a broad definition of Mindfulness . Mindfulness includes intrapersonal activities such as sitting meditation, walking meditation, forms of yoga and prayer. But it also includes interpersonal activities such as deep listening, story telling, empathy training, forms of martial arts, contemplative art & music, contemplating nature. Paying attention in a particular way, on purpose, in the present moment non-judgmentally. An awareness of ones conduct and the quality of ones relationships, inwardly and outwardly in terms of their potential to cause harm are intrinsic elements of the cultivation of Mindfulness. Founder of MindUP - a school-based program that integrates Mindfulness into daily life; author of parenting book "10 mindful minutes"
Director of The Inner Resilience Program whose mission is to cultivate the inner lives of students, teachers and schools by integrating social and emotional learning with contemplative practice. the younger sister of His Holiness the Dalai Lama, who has dedicated her life to educating Tibetan children in exile. Link. Published on December 21, 2012 by Victor Chan. This was what the Dalai Lama asked assembled dignitaries and guests to consider at the 2009 Vancouver Peace Summit. A simple question premised on a provocative idea: Educating the Heart is foundational to preparing children for the 21st Century. The social and emotional development of children is the leading edge of education, mental health, and brain development science. BC is at the forefront of this, although the province can be characterized as a collection of islands of social and emotional program activity. The missing ingredient – the need – is a convener to connect the strands of activity such that the level of collaboration, shared practice and research has a transformative influence on the province. In this way, educating the heart will become a core focus for all who engage with children – in every classroom and community – and embedded in education and mental health policy. With a mission to Educate the Heart, the pieces are in place for the Dalai Lama Center to advance BC’s efforts to foster the social and emotional learning of children. The audacious goal is that this province can be an example internationally of how caring communities are raising compassionate children. The Dalai Lama Center is deploying all its internal and external resources toward this clear and compelling role. Through programs that convene, advise, educate, and apply research we are working with leaders in education, science, politics, government, business and philanthropy who understand the value of social and emotional learning. By using local, regional, national and international connections, the Dalai Lama Center is helping to share evidence-based practice and encourage collaboration. In short, it’s a strategy of supporting, encouraging and leading a rising tide of awareness and action toward educating the hearts of children. We hope that by the time the Dalai Lama visits Vancouver again in October, 2012, the Center will have achieved tangible outcomes in our strategic focus and show the world that BC is indeed at the forefront of educating the whole child.